Objective Face recognition technology has extensive applications in many fields because of its user-friendly and intuitive nature. According to input data, face recognition can be divided into 2D and 3D. Traditional 2D face recognition technology is based on image or video information. Although 2D face recognition technology has achieved a great success, its limitations, which are mostly caused by illumination, posture, and makeup, remain difficult to address. 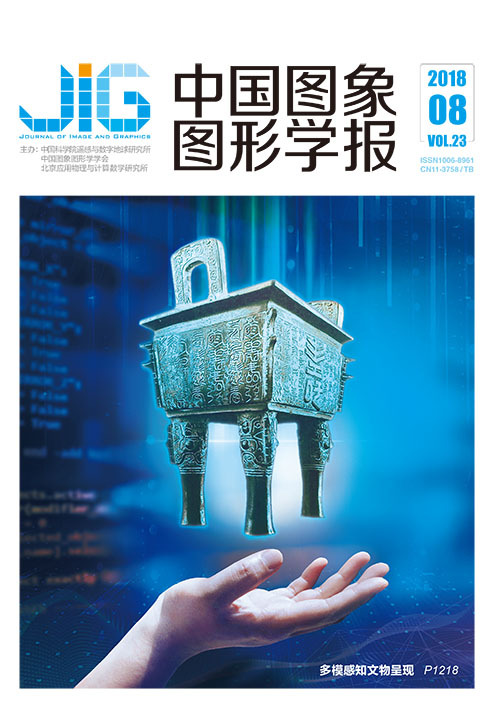 Unlike traditional 2D face recognition, 3D face recognition is based on the 3D data of human face, such as 3D point cloud and mesh. Although 3D face recognition technology is less affected by illumination, pose, and makeup, partial occlusion in 3D face is an important factor that affects its accuracy rate. The problem is that collected face data are always occluded by external objects, such as hands, hair, and glasses. 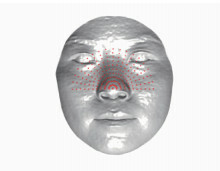 Therefore, 3D face recognition with partial occlusions becomes an important research subject. To reduce the influence of partial occlusions in 3D face recognition, a novel 3D face recognition algorithm based on radial strings and local feature is proposed. 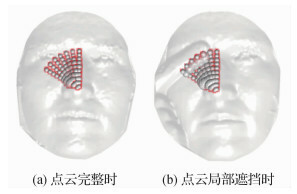 Method This 3D face recognition algorithm includes four main parts. First, the nasal tip on 3D face data using shape index is located, the radial strings are extracted, and then the uniform sampling on every radial strings is produced. To fully use the neighbor information of radial strings, a radial string representation that encoded radial strings into local feature is proposed. In this algorithm, we extract three local features, namely, the center of every two adjacent sample points, the area of local region, and the histogram of slant angle. Local feature descriptors with these local features to represent local region are then constructed. Second, sparse cloud points lead to nonuniform sample points and subsequently to large errors in the matching result. To address this problem, an operator that merges adjacent local regions is adopted. 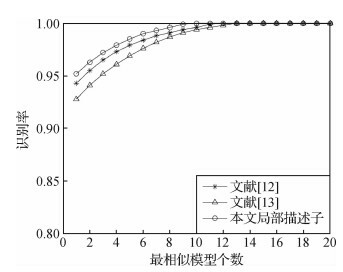 Third, cost function of the local feature on the corresponding local region and similarity vectors of the corresponding radial strings with this cost function are constructed. Finally, the corresponding radial strings according to these similarity vectors are matched, and the 3D face by the result of all radial strings are recognized. Result The experiments are conducted on the basis of the FRGC v2.0 and Bosphorus databases. FRGC v2.0 is a large-scale public 3D face database, which is composed of 466 subjects and 4007 3D point cloud. Bosphorus database is a new 3D face database, which is composed of 105 subjects and 4666 3D point cloud, and this database consists of partial occlusions at different levels. We select 300 subjects with neutral and not occluded 3D face point cloud to test the recognition rate of different local features. Consequently, the rank one recognition rate is 95.2%, 0.9%, and 2.4% higher than the other two local features, because FRGC v2.0 database is standard and at a high level. Although one local feature is only 0.9% higher than the second local feature, those local features promote the convenience of merging adjacent local regions. We then choose 300 3D face point cloud from Bosphorus database to perform the experiments of recognition rate and time with partial occlusions 3D face. The rank one recognition rate is 92.0%, 2.7%, 3.0%, and 0.4% higher than the other three recognition methods. The experiment is performed within 8.17 s, which is lower than that of the other recognition methods, and is 2.05 s, 0.18 s, and 34.43 s less than the other three methods, respectively. In those experiments, our methods receive the best result based on its recognition rate and recognition time. Conclusion The proposed method of 3D face recognition based on radial strings and local feature extracts the adjacent information of radial strings effectively, thereby constructing cost function of corresponding local regions with the adjacent information to achieve region matching. The similarity vector that is constructed using the cost function of the local feature reduces the influence of partial occlusions effectively. This result demonstrates that the proposed algorithm achieves high recognition rates and is robust to partial occlusions. This 3D face recognition method is suitable in recognizing faces with partial occlusions. However, this method is inapplicable when the nasal tip is occluded because this method must locate the position of nasal tip. Visvalingam M, Whyatt J D. The Douglas-Peucker algorithm for line simplification: re-evaluation through visualization[C]//Computer Graphics Forum. Blackwell Publishing Ltd. 1990, 9(3): 213-228. Savran A, Alyüz N, Dibeklioǧlu K, et al. Bosphorus database for 3D face analysis[C]//Proceedings of the 1st European Workshop on Biometrics and Identity Management. Roskilde, Denmark: Springer, 2008: 47-56.